I'll always have time to read this free, wonderful magazine. 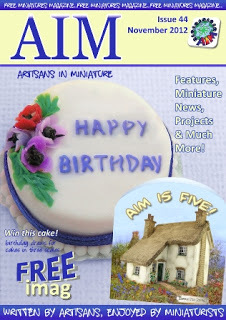 Go here http://www.artisansinminiature.com/issue10.html to download or read the latest issue. Thank you for your very nice comment on my blog, which make me very pleased, Ruth. Thanks for the reference to the free magazine. I hope it goes well with your online shop. I have not forgotten you, but I have just a bit much at the moment. Hello from Spain: thanks for sharing. We keep in touch.